In Wing Chun, there are 5 main principles of combat. These include assuming structure, intercepting, breaking an opponent's structure, chasing, and adjustment. In Wing Chun Kuen, the term Bai Jong is often translated as "on-guard, ready position" or as "pre-combat position." None of these translations do the term justice. Bai is the Chinese word for "put, place, arrange, assume," while jong is a "stake, a pile, or a vertical structure." Thus, when combined, bai jong is a Wing Chun term referring to the assuming of structure in relationship to your opponent, making the necessary adjustments to favor advantage for yourself. Your body structure is dynamic, always seeking to adjust relative to your opponent. It is ever changing with pressure, position, timing, and sensitivity. You are always making adjustments (perhaps another good translation for the name "Wing Chun"). In all martial arts, there is some sort of pre-fighting position or on-guard stance that practitioners assume before engaging their opponent. Some of these positions are open, others are closed. Bai Jong in Wing Chun is different. It is used as a reference point, not as a fighting posture. One adopts a non-verbal readiness to receive an attack. Generally speaking when an opponent adopts an open position it is to trap, to lure in, or to entice entry. This is known as drawing an attack. We believe that in Wing Chun there no real ready posture, as all postures are ready positions and we are trained to fight from any position. The ready posture or position is not a set, dead position, but one that takes into account not only body placement but mental attitude and preparation. And while some pre-fighting positions look intimidating and serve to cause awe or caution, as a mental note to yourself, never be fooled, distracted or intimidated by such positions. They are only positions and not an indication of an opponent's skill. Bai Jong is a transitory position and the means of preparing for defense or offense. As such, many factors are happening simultaneously. You must have a calm and reflective attitude and focus on the centerline and mutual centerline. The stance should be rooted, but not immobile, static, rigid, or dead. Instead, it focuses on maintaining the plane of the shoulders and the hips perpendicular to the centerline between yourself and the opponent. The idea is to also position yourself so you have the most anatomical tools at your disposal to use on your opponent. With Bai Jong, you must receive as much information on the opponent as possible in the amount of time available. For this, you use your eyes to perceive the opponent's demeanor, his posture, his breathing, his stance and balance, his physical strength, and the surrounding environment, such that you can use it to your advantage. The eyes must gaze at the opponent's sternum. This is the point where initial arm movement starts. While an opponent's eyes may show their intent, but looking at the sternum shows their action and movement. At a distance, eye sensitivity is most important; at close range, bridge sensitivity is most important. When you can, you must use your eyes to capture all the information you need prior to contact with your opponent. Train the eyes to not only see but to perceive the opponent's intentions. Some Wing Chun instructors posit that it is best to watch an opponent's elbows and knees for an indication of when they will strike. However, the idea of looking at the elbows and knees is elementary and suitable only for beginners. Intermediate students generally look at the rising, falling, and torquing of the shoulders. Advanced students train to look at the opponent's chest and to be able to detect the slightest rotation or change in depth of field. You should not look at the face, as your opponent may use his eyes as a feint. You must train the eyes not to blink during combat, especially when matching with weapons. Again, the gaze is not fixed, and one should always use their scanning and peripheral vision. We have a saying in Wing Chun that advises us to the use of the eyes: "When you see form, strike form; when you see shadow, strike shadow." This statement is profound, for it presumes you have mastered the unfixed gaze, and informs you that you cannot always rely on the shapes and forms that are presented to you. Facing is also an integral part of Bai Jong. It is referred to in Chinese as Chiu Mien, Chiu Ying, Ji Ng Ying, Dui Ying, or Doi Mien. They are all loosely translated as "facing" in English. When facing, it is important to maintain the proper position and area, which is referred to in Wing Chun as "protecting the centerline." 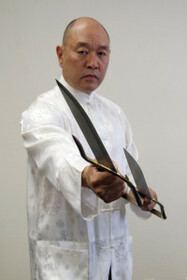 In Bai Jong you maintain an "asking hand" and "guard hand." Most practitioners confuse these hands as the "on guard position" of Wing Chun. However, they are merely reference points. The asking hand is the hand that asks your opponent a question. The guard hand is the hand that protects you when your opponent answers that question. Based on where your intention is, either hand can be an asking hand or a guard hand. When we define the asking hand and guard hand, we seek to maintain control of the inside and outside gates, which we use as reference points for a locale of the body. We break up the body into nine zones: high, middle, and low and right outside, inside, and left outside positions. Some consider it to be 6 zones. We maintain control of our gates and angles of entry such that we can always use two hands simultaneously. The elbows should remain a constant one fist to one-and-a-half fist distance from your body to avoid the two diseases of wing chun: the restrained bridge (an arm that cannot move freely) and the flying elbow (a poorly positioned elbow such that one cannot adequately defend). Maintain the "elbow down power" to link your hands with your body structure. Facing is the proper way to position. Many beginners face square to the opponent. I believe proper facing is when you have an advantage over your opponent, where you have two limbs to the opponent's one limb, or you have two limbs to the opponent's no limbs. In order to do this, footwork must coordinate with the bridges. Footwork is what leads us to what we call chasing. A central theme to wing chun is Jeet (to intercept). You need to be proactive and think ahead to close-off an opponent's ability to continue; to deliberately place your body in front of the opponent and to limit his next motions. The concern when intercepting is to recognize the signs before an action has been delivered. A good martial artist will study other martial arts to familiarize himself with tell-tale signs or telegraphic motions. Intercepting is the point of meeting and capturing the opponent's centerline. If you are not in contact with an opponent when you first engage in combat, you must enter properly. All of this is in conjunction with entry timing (your starting time) to initiate attack or counter attack. Usually, this takes the form of intercepting, trapping, or destroying to cause mental unbalance and to delay reaction time. Learn to enter when an opponent is preparing, developing, extending, withdrawing, or in a transitory (pause) phase. These are what I refer to as "entry on preparation," "entry on development," "entry on extension," "entry on withdrawal," and "entry on response check," respectively. Each of these are described in detail below. Entry on Development: This is to enter as the opponent initially delivers his blow, at which time he has not built-up sufficient momentum and power and extension to strike you. In essence, here you smother your opponent's blow. Entry on Extension: While this is the most common method of demonstrating attack and defense, in actuality it is the most inferior method, as one must deal with the opponent's full power, extension, momentum, and inertia to stop his blow. In wing chun kuen, it is not recommended to work on this timing. Entry on Withdrawal: This is to enter when an opponent has withdrawn a blow that he has missed or connected with its target. In essence, one enters with the complete body structure to smother any future movements. Enter on Response Check: After an opponent has delivered a blow, there is often a momentary pause for him to scan the extent of his damage and check for an additional response. This is an excellent time to enter and counterattack. These are transitory positions when you bridge-the-gap between you and your opponent. In entering, you are one unit. When one part moves, the entire body moves. All of these methods of entry exemplify understanding of a complete single beat: the time it takes for a strike to reach from A to B, the time it takes from jump to jump, or the time it takes from one step to another step. In order to exploit and enter on preparation, development, extension, withdrawal, or response check, one must understand the various timings of entry on that single beat. These timings include typically timing our entry on the quarter beat, half beat, three quarters beat, and the like. Entry on withdrawal is considered a one-and-a-half beat, as the opponent has already reached a full beat and is withdrawing his hand or leg attack. Entry on the response check would typically be considered a full second beat. All of these movements are transitory. To intercept is also a means of slowing down your opponent's reaction time. Reaction time is typically slowed down when a person is not well trained, does not know the outcome, lacks flexibility, is older, is tired or injured, is concentrating on something else, is emotionally upset, is considering options and choices, his breathing is labored, and when his equilibrium is off balance. Much of the effectiveness of wing chun is developed upon slowing the opponent's reaction time down and giving them the option to continue. One brain has to sort all the stimuli or questions posed by the opponent, then answer the questions with the appropriate response, tool, body structure, distance, timing, and positioning. After initial contact, you must unlink by shifting your body or by redirecting the opponent's force. The proper stance must be maintained throughout. Being able to sense when to link and unlink is the essence of experience and is essential to wing chun. Your sensitivity is dependent upon it and you need to have what I call the response check. In a response check, you do a damage assessment, observing and reading the non-verbal signs. You change as your opponent changes and fit-in with your opponent's flow. Although wing chun does not emphasize stepping back, at times we must withdraw from an attack to do a response check. An example of this is when we utilize a biu jee (darting fingers) or fut sao (whisking hand) position. when setting-up or guiding the opponent. In all three cases, you want to apply pressure to get feedback as to how your opponent will react. What may prevent you from utilizing the response check is when you are preoccupied with something else, make incorrect assumptions, execute a premature entry, fail to see beyond what is present, have too many things to deal with at a time, or when you are interrupted. So always stay focused and centered. Breaking the opponent's structure is central to successfully applying Wing Chun in combat. This is what we refer to as Por Jung Sien (breaking the center of gravity or centerline) or Chum Kiu (sinking the opponent's structure). Our goal is to break the line of the spinal column, or what we refer to as the centerline. We do this by distorting or twisting this plane, thus breaking your opponent's center of gravity, leaving his structure vulnerable to attack. The goal in mind is to slow down or ultimately stop the opponent's ability to react or respond. When we have destroyed the opponent's base of attack, he cannot attack us anymore. This is what is meant by breaking the opponent's structure. In Wing Chun, we seek to destroy the opponent's structure through constant forward pressure, or what we call "crowding." In Wing Chun, you want to constantly pressure your opponent, crowding his motions. Don't allow your opponent to fully extend his blows, reaching maximum power and extension. You eat his space up as if you were an ameba. When he retreats an inch, you advance a mile. When his back is up against a wall, you try to push him through the wall. We can also break the structure by pushing or pulling and setting him up with strikes of our own. In Wing Chun, transitional motions are intermediary movements designed to keep you in combat and to reach your final goal of finishing off your opponent. They may take the form of controlling, guiding, leading, sticking, deflecting, combinations and so on. They may or may not cause a shocking delay to your opponent's reaction time, but are used to set-up the opponent in order to finish him off. In classical Chinese martial arts terminology, these are known as the "bridge crossing maneuvers." They are transitory movements or positions and consist of two sub-phases of finishing and withdrawing. Finishing is generally strong final movements that will end the fight. They can be characterized by the finishing strike or kick, finalized joint lock or throw, or ground control and submission of an opponent. Withdrawing is the breaking off of the attack when the opponent can no longer continue, which leads us into the next important principle - chasing. We refer to chasing in Chinese as jui (to chase after). Chasing is an intermediary movement designed to follow and cut-off an opponent's movement and escape or flight. It is to continue and carry the battle to him. It is also to seek advantage in positioning. When you have acquired a target, you must constantly seek to attain that goal. You are chasing the opportunity to break the opponent's structure. It is easier to move yourself than your opponent, except when his intention is to retreat, or when you have already broken his forward inertia and have replaced it with backward inertia. The goal of chasing is to pursue the positional advantage, opening in an opponent's structure, an opportunity to knock him down, control the line, or to keep your proper facing and positioning. Related to chasing is when the tables are turned and you are in danger of having your structure destroyed. In this situation you have to adjust your steps accordingly. In Wing Chun, we call this Wui Ma, which literally means "returning step." One never retreats in Wing Chun, but strategically regroups, plans, or adjusts the step. Adjusting the step is simply used as a better positioning devise for a response check in which you may re-assume a bai jong and begin again the entire sequence of the main 5 principles. Both chasing and adjusting are considered methods of changing and returning to the centerline. The 5 main principles of Wing Chun are central to the art's effectiveness in self defense. The first 3 principles of assuming structure, interception and destroying the opponent's centerline are the core for facing and stopping an attack. If these are successful, there is no need to adjust or chase the opponent. Self defense is where one is to break off a counterattack as soon as one has stopped an opponent's attack. The five principles of wing chun allow a person an effective means of self defense and protection by recognizing the correct timing and positioning of the proper tools in combat.